Some topics seem so big, and news coverage of them can go on for so long that interest and empathy can start to drain away. 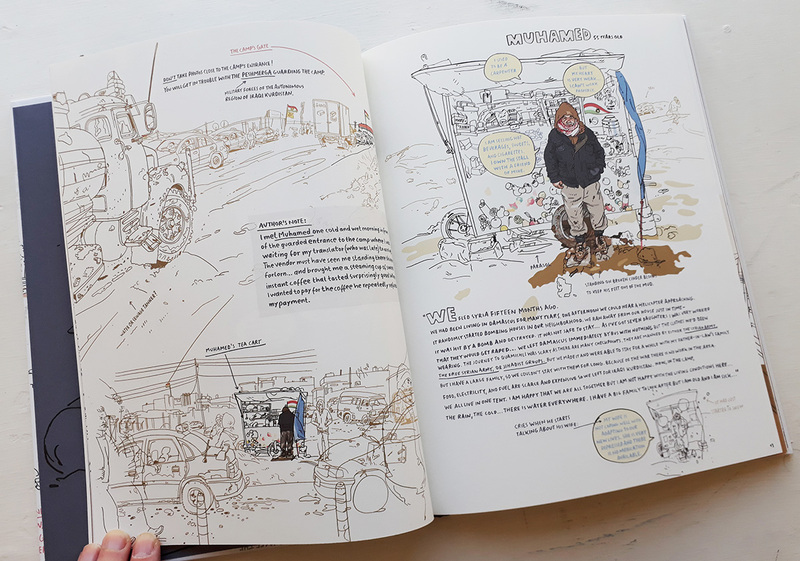 This is when reportage drawing can offer a different approach, and Olivier Kugler’s new book, subtitled ‘Encounters with Syrian refugees’, brings the reader right up to the people Kugler meets, feeling present as he records their conversations, with his layered drawings capturing the gestures and movements of his subjects along with their surroundings. 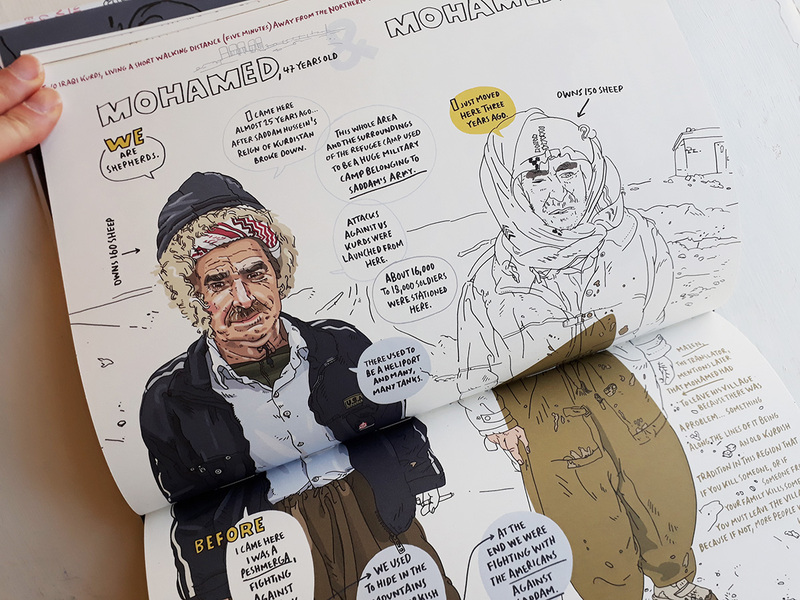 Although sometimes appearing complex, an increase in drawn detail and colour leads the eye to certain areas of the illustrations and numbering of sections of text helps navigate the stories the refugees tell as they reveal where they have travelled from and why they are in their present situation; whether that is settled in a European country or still on their journey. 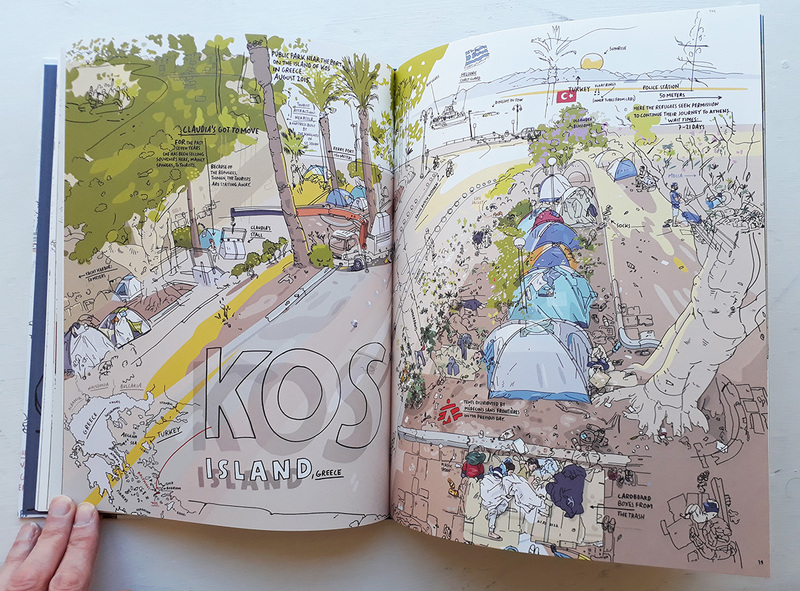 Kugler draws and describes the interviewees environments in absorbing detail, with elements picked out in the illustrations – a food tin used as an ashtray, a lone tea bag or a refugee’s book in the English language. 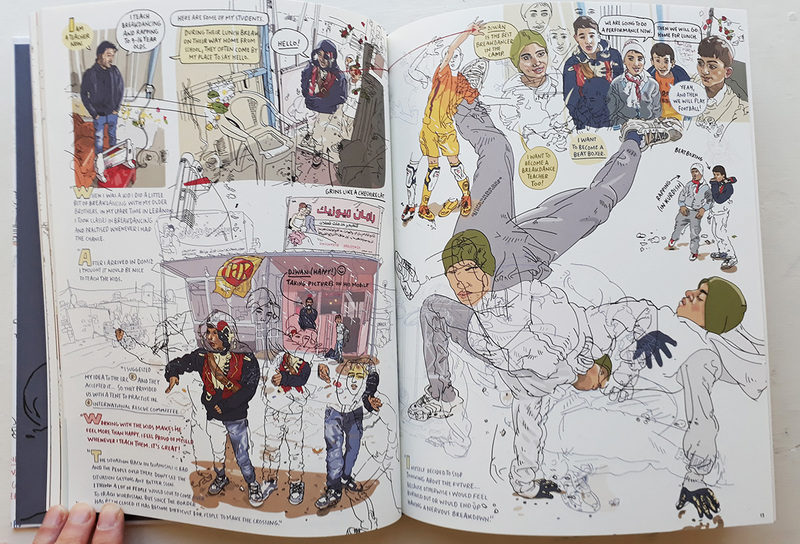 A fantastically vibrant spread of Djwan’s breakdancing pupils in the camp show’s Kugler’s approach at its best – overlapping line drawings and vignettes accented with colour. 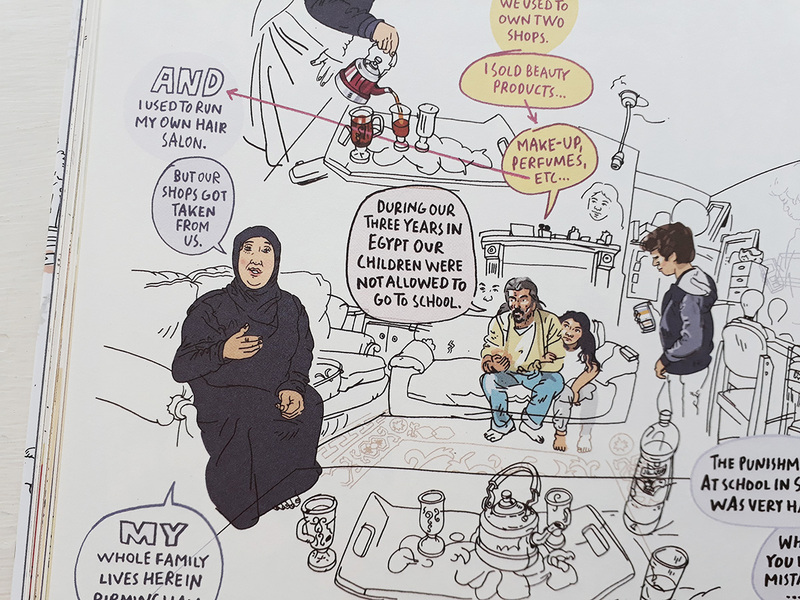 On the French coast, in Calais’ ‘Jungle Camp’, Kugler meets more young men who describe their frequent attempts to reach the UK; the logistics of getting into the truck parks to stow away on vehicles crossing the Channel, and the fascists’ in Calais who have attacked immigrants. Although familiar from the news, Kugler makes it personal, bringing the reader not just inside of the men’s rough accommodation but also their lives full of major challenges and hopefully achievable ambitions. 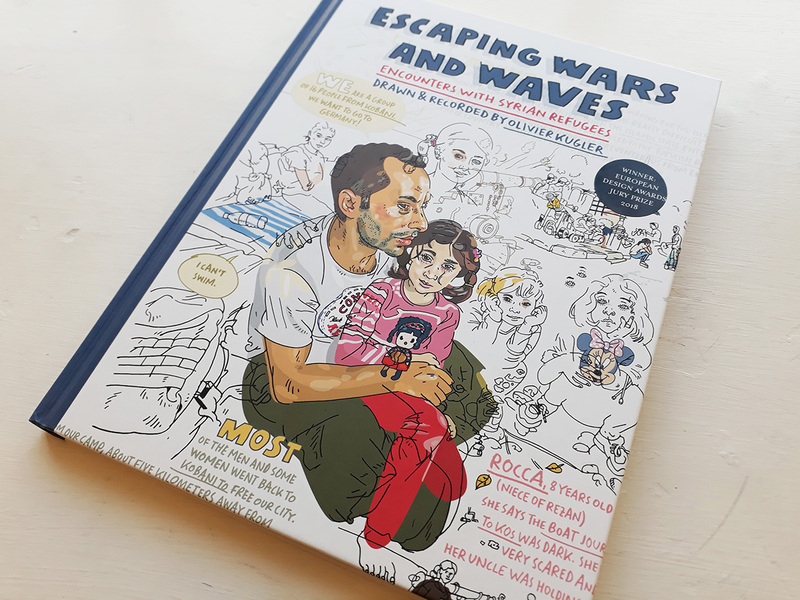 Escaping Wars and Waves is richly deserving of its Jury Prize from the European Design Awards 2018, and is a positive addition to the ever building reputation of both Kugler and reportage drawing itself.